Posted about having this on Twitter and a friend wanted the recipe. Ask and you shall receive! We’ve been making this dish in our family many years. You can swap out or change the main ingredients to make it vegetarian if you so wish. Easy to make, and yummy. Have fun! Heat oven to 350 degrees. 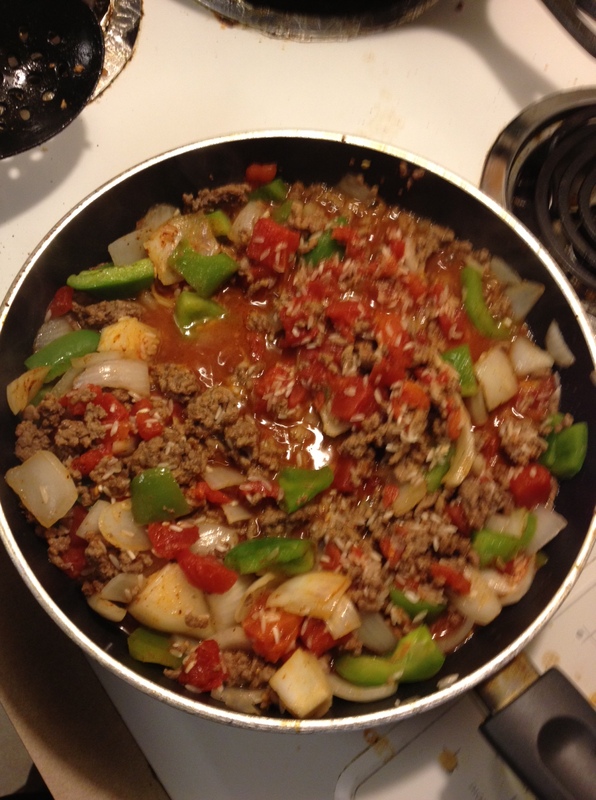 Brown ground beef in large skillet until light brown, drain. Add onions and green pepper, cook and stir until onion is tender. Stir in tomatoes, rice, chili powder, salt, and pepper. Heat through. Pour mixture into ungreased 2-quart casserole. Cover, bake 1 hour. *Sorry about the blurry picture. Steam got on my camera lens, haha. I all for some Texas hash! Looks good. We grew up on this, although it was called chili rice at our house!